TRAINING PLANS WITH 7 WEEKS TO GO! Almost incredibly the first run of the year is just over 7 weeks away, the 10km event on the Gold Coast (http://www.gcbfunrun.com.au/ for entry details). You always tend to think there is more time until an event than you think, but suddenly the day comes closer and closer before it arrives at a time you feel under prepared. Then the cycle repeats itself for the other events that I have planned. Training is the important component to successful completion of any run over any distance, although to be truthful I managed to finish the 5km Bridge2Brisbane last year without any training of note after a calf injury. In sharing my training plans and techniques on this blog, I will preface this by saying that I have ZERO qualifications in personal training or anything like that, nor do I pretend to know that such plans will work for every person, for every runner likes to use different techniques and strategies to prepare for events. The challenge for me personally is not to peak too early in any training for any event for two reasons. With the schedule that I have planned, and with possible additions to be made as my availability for such events become clearer, I have to consider prioritising which events I am trying to peak for, without devaluing the other runs that I am participating in. With my aims to revolve around the 14km events in June and August later this year, the earlier runs are something I can incorporate into the training particularly with the reduction of the Perth run by 2km. Also complicating matters is my football commitments (Australian Rules Football, AFL is the name of the elite league and not the code and administrators would do well to recognise this). This is the plan that I have formulated for training until the City2South event in June. This is definitely subject to change depending on work commitments, fitness and football duties. Click on the image below to see the full training schedule, for many computers will only show half the image. 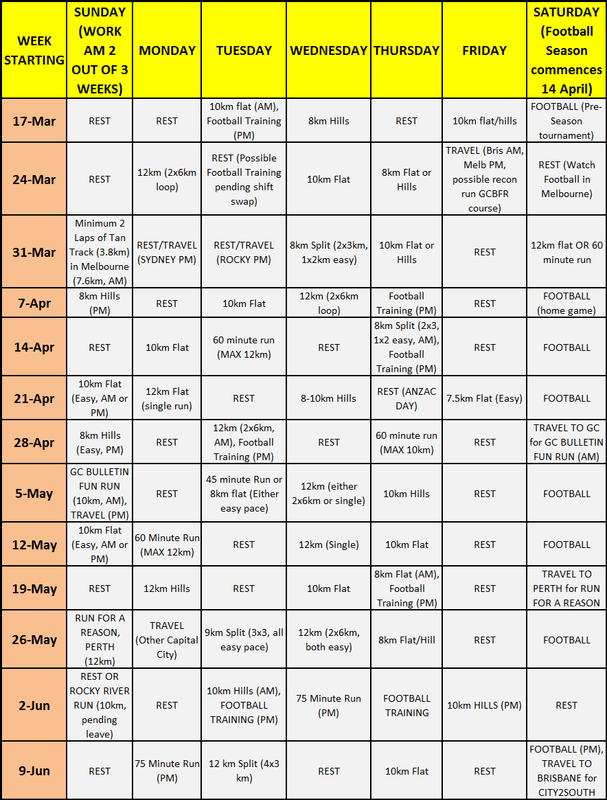 For those that readers who don’t want to follow a plan, the advice I can give from experience is to try to do 30km a week for the first month, before building to 40km in the build up to the 14km event. I also subscribe to the theory that running a distance greater than the race journey can be beneficial for a 12km race can easily become longer considering the traffic at the start line that one may encounter in order to secure clear running. I guess I’d better start following the plan and get ready for training!